The setting was a Paris apartment. The “us” referred to a small gathering of folks who, mostly, work in or around the alcohol and media worlds. And the “he” of debate was natural wine evangelist and (at the time) object of intense media scrutiny over then-current events, Pierre Jancou. Here’s the if-you-missed-it summary: a muckety-muck at a fashion mag hit up Jancou for a free meal at his restaurant Vivant Table. The dangled carrot was positive mention in Mr. Muckety-Muck’s publication. This sort of gross pay-for-play quasi-blackmail happens all the time, and most restaurants just bend over and take it, figuring the publicity is worth the cost. Jancou’s restaurant is tiny, perpetually overbooked (well in advance, too), and has zero need of such publicity. Given this freedom, Jancou said no. Hard words were exchanged over email. Now, the tale could have ended there. Except that Jancou passed the story, complete with email proof, to a bunch of writers who were naturally inclined to be sympathetic to Jancou’s objection, and likely to spread the story. Which they did. And did. And did again. I arrived in Paris the day after the hullabaloo hulla-ballooned, and everyone (“everyone” being a self-selected cohort of folks, many of whom I count as friends, acquaintances, or trusted sources) was talking about it. Naturally, the backlash – not much of one in comparison to the pro-Jancou outrage, but it was there – arrived soon after. Motives were examined. The question that seemed most prevalent was the most obvious: didn’t Jancou end up turning this into a giant PR victory by his own savvy use of the media? A few months earlier, I’d seen this debate play out in different context. On two different wine fora, a drinker with a bit of a reputation for contrarianism-without-justification went after winemaker Eric Texier, essentially calling his participation on those and other fora no more than transparent publicity-seeking, and going on to suggest that anyone who fell for it was brainwashed. The issue, apparently, began with the drinker’s dislike of Texier’s wines, but from there, the conclusions – each darker and stranger than the previous – followed. So what are Texier’s motives for participating on wine fora? He says, among other things, that they’re to provide information, often corrective, in discussions of wines and winemaking. Occasionally regarding his own work, much more often not. Since he very pointedly does not shill, openly or otherwise, for his own product, and in fact posts as his claimed motivation would suggest, I’ve no reason to think he’s lying. So what about the accusation that Texier gets a publicity boost from this participation? Well, of course he does. If it damaged his brand, he’d be an idiot to keep doing it. I’ve seen winemakers, restaurateurs, retailers, and others damage – even destroy – their reputations through ham-fisted use of technology and social media. And Texier is no idiot. He uses his participation well. And yes, his reputation benefits as a result. To suggest that this should not be is to suggest that either Texier can’t use the internet because he might gain from such use, or that he must use it less well. These are ludicrous positions to take, though that didn’t stop one finger-wagger from taking them. If Texier’s participation in a discussion works to his benefit because he adds value, and he in turn receives value from that participation, where is the damage? I see none. If Texier’s wines are bad (which, in my opinion, they most certainly are not), then disappointed consumers will sort that out for themselves, irrespective of Texier’s online musings. The benefits stemming from Jancou’s media firestorm are somewhat more indirect. As noted, it’s not like he has empty seats to fill; perhaps a few more people could stuff themselves into his shoebox-sized wine bar, but only at tourist hours. Yes, there’s theoretical benefit to “Brand Jancou,” but since he’s not shown much inclination towards franchising or Vivant-logo mugs and t-shirts, all it really gets him is more regular quoting in the media…a mixed blessing to an evangelist for a category of which many remain skeptical. 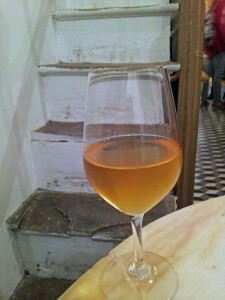 One thing that the attention does bring, however, is corollary illumination for the natural wines that Jancou promotes. Since his only direct financial interest in promoting these wines is if you drink them at one of Jancou’s establishments, which as I’ve noted isn’t all that likely unless you’ve planned well ahead, I again think it’s reasonable to take him at his word. Instead, I submit that to the extent that there was promotional intent behind Jancou’s actions, it was less numerical than it was qualitative. Anyone who follows Parisian restaurant buzz knows that, especially since the installation of a new chef and a corollary upgrading of the kitchen’s ambitions (see below), Vivant Table is a “hot” reservation. In fact, there are few hotter. By getting his side of the story into the press, Jancou doesn’t do much to increase the number of potential diners – in fact, if anything he probably holds off some portion of the available pool by resisting those who want in simply to say they’ve been – but instead increases the likelihood that diners are there because they are sympathetic to his restaurant’s philosophy. Vivant is as much a statement as it is a restaurant, and that’s not the sort of thing everyone enjoys. Those who don’t now have reason to stay away, clearing the field for a few more of those who do. Here’s another reason to take Jancou at his word. A few nights after the imbroglio, I was standing outside his wine bar with a mutual acquaintance, chatting with the man himself. Naturally, this was one of the subjects. He grew increasingly animated, and what seemed to enrage him most was when his free-meal-seeking correspondent suggested that Jancou was well-known as some sort of skinflint, as stingy, as someone who’d refuse a simple request due neither to principle or practicality, but basic meanness. (Needless to say he did not agree with this interpretation.) His agitation and animation while recounting this were quite obvious and I don’t for a second believe they were feigned. So did Jancou take an irritating encounter and turn it, via a willing media, to his benefit? Sure, but I submit that it doesn’t really matter. Yes, his case was amplified and abetted by interlocutors. But it’s a good case, or at least it’s the case he wishes to make for his restaurant and his passion. He has other methods of publicizing what he does, but why should he fail to make the best use of the sort of gift publicity provided by this incident? If he’s being duplicitous or is, as they say in Texas, all hat and no cattle…well, as with Eric Texier and his wines, disappointed diners will sort that out for themselves. And I haven’t noticed reservations at Vivant Table getting any easier. Securing a table at Vivant Table is far from the hardest thing I’ve ever done, restaurant-wise, but it’s no destination for last-minute deciders. In my case, five weeks of advance notice are required for a late seating, the hour of which is changed several times by the restaurant as the night approaches (though at the restaurant I can’t tell if the time-shifting has accomplished anything…maybe a very late third seating for someone?) I do note that more than a few people are turned away during the first hour of my meal, even a few who claim to have reservations, though I’m not eavesdroppy enough to assess the details. In any case, it’s a tiny room in which one can be sure that most everyone who’s there wants to be there, or at least is accompanying someone who does. And it doesn’t offer much in the way of negotiation: the choices are a set menu, or a set menu with matched wines. This sort of restaurant-dominated approach, which I think many places would like to try but don’t, has been given a healthy lungful of oxygen by the ideologically-driven natural wine movement, and such places now litter Paris and are popping up in other cities, in Europe and elsewhere. There’s been follow-on benefit to non-natural places who, given tiny kitchens and limited seating, would like to shift the point-of-view to that of the kitchen rather than of the table, and I’m enthusiastically behind the movement. Of course, I can say that because I’m an omnivore. Consecutive courses of sweetbreads, blood sausage, and multiple takes on venison do require somewhat of an open palate. This is aggressive, frequently brilliant food that takes the ingredient-focused cooking for which the restaurant was previously known and enlivens it through some very accomplished, almost swaggering cooking. There are some chances taken, and not everything succeeds (the blood sausage, for instance, is easily the most brilliant version thereof I’ve ever tasted, and finds a sweet counterpoint in an autumnal squash purée, but is paired with an utterly pointless bit of octopus…perfectly cooked, yet akin to a tuba player joining an in-progress violin quintet). But more than enough does succeed to make this one of the more interesting menus in Paris. Love it or not, if anyone is bored here, they are jaded beyond repair. 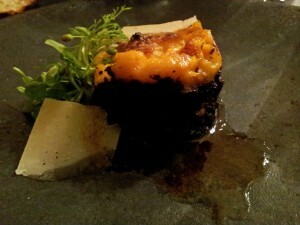 It’s also extremely rich food, of course, and one will want to arrive with not only an open palate, but an open belly. Despite a pretty good familiarity with natural wines as they exist on American shores, and many visits to other French covens of naturalia, Jancou’s explorations litter his shelves and his lists with a fair number wines I’ve either never tasted or have never even heard of. Not wanting to miss out on the latest and quirkiest, I do something I rarely choose to do and give myself over to the restaurant’s suggestions. Unfortunately, due to circumstances beyond my control (and no fault of the restaurant’s, either), the evening comes to an end before I can get a written version of the wines – almost all unfamiliar to me – so what follow are the only two names of which I’m certain. But there’s also a dark orange “white Burgundy” that’s not, as far as I can tell, actually an orange wine, several spiky reds (including one from sangiovese), and other highly individualistic offerings that sometimes range far beyond the borders of “mainstream” natural wines. Do some of them taste like cider, white ale, lambic, distant cousins to vin jaune, or really almost anything but what one conceives of as “normal” wine? Yes. (Some don’t, and in fact taste quite familiar.) Some of them are good matches for the food and others are far too demanding of attention to coexist. I wouldn’t want an unending diet of such experiments, even the good ones. But to have one’s assumptions so aggressively challenged is both an intellectual and an emotional thrill-ride, and this is why I don’t choose between natural and traditional wines, but instead drink both. Yes, sometimes, one wonders why anyone would let certain fates befall otherwise defenseless grapes. But that’s exactly the point of natural wine as a philosophy, isn’t it? Risk is inherent in the genre. Universal pleasure is not. Vivant Table’s room is somewhat uncomfortable, despite the quirky retro brilliance of the décor (rescued from the room’s previous incarnation), yet the slightly edgy discomfort matches the culinary and vinous experience on offer, and thus makes a certain amount of sense. Service is brusque in the very familiar French manner, which means you’ll get careful attention when someone’s at your side, but it’s best to not wish for things while they’re not. That said, at the end of our meal there’s an issue that requires a bunch of staff attention – again, nothing that’s the fault of the restaurant – in the face of which they couldn’t be kinder or more briskly attentive. I read back over this review and see far more ambiguity and hedging than I really feel. There’s a perpetual debate amongst those who assign ratings to things and those who don’t, into which someone inevitably drops the cliché that the only rating that matters being whether or not one would repeat the experience. I don’t rate things, but I’ll answer the cliché: I’d go back to Vivant Table in a second. No matter how many weeks it takes to get in. 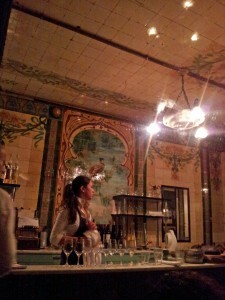 Moreover, I love the restaurant, and part of that love is accepting that I will not love everything at the restaurant. I’ve a friend who complains that almost none of the wine bars that litter Paris are actually wine bars, but instead are restaurants with a lot of wine by the glass. I don’t really grasp the rigor of his definition, which seems to preclude either everything-but-charcuterie or seats (I forget which, possibly because I’m making fun of him), but I’d be tempted to draw the dividing line between places that feel like restaurants – sit, chat, graze in your own space – vs. places that feel like bars, in which one elbows up, through, and away, maintaining near-constant physical contact with one’s neighbors, or if seated feeling like a passel of them are hovering overhead and wishing you’d give up your seat. By that definition, Vivant Cave is very nearly a true wine bar; there are seats at the bar and a few around teetering tables at the back, but it’s…let’s call it physically convivial. The food – a few products-on-plates, a constantly-changing short list of quick assemblages – is inconsistent, though locals tell me the menu has gone through a fair number of changes since the bar’s (recent) opening. On two occasions, an octopus salad is vibrant and perfect, a stenchy andouillette is fine, blood sausage – which I’d find hard to believe is the same as served next door, though if it is they’re capable of mistreating it – is just OK. Two different preparations of burrata are magnificent. Disclosure: in conversation with Pierre Jancou, I inquire about the availability of an older Overnoy Vin Jaune, an expensive and very difficult to obtain wine. It’s made clear that the deciding factor is not money so much as an understanding that the purchaser will properly appreciate the result. I am eventually able to buy the wine (not at a discount), so to the extent that this is special access deserving disclosure, I’ve now done so. This and other travelogues encompass multiple temporalities, for the blog format does not easily accommodate imposition of timeframes other than its own rigid sequentiality. That is to say: if I’ve visited a place on three separate occasions, posts arising from those visits will not be kept separate. All future travelogues will thus be undated, with only the dates that always follow wine notes indicating when they took place. Travelogues from the past are in the process of being unshackled from their own temporal moorings.